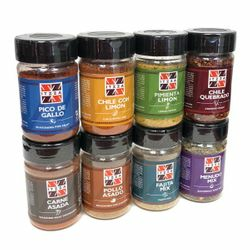 ITZZA Seasonings Mixes and Rubs include: Carne Asada Mix, Pollo Asado Mix, Fajita Mix, Menudo Mix, Chile Quebrado, Chile con Limon, Sal Limon, and Pico de Gallo. ITZZA the spices that make up the flavorful seasonings come from a land that has been cultivated for centuries recalling the times of the ancient Mayans and Aztecs of Mexico by implementing the same techniques and traditions of the past. ITZZA brings you the rich blends of spices that today make up all of your favorite authentic Mexican dishes. ITZZA Brand is inspired by the mystery, art and science of the fabled ancient Yucatan peninsula Mayan city "Chichen Itza". ITZZA harkens back to the past but has an updated feel and contemporary style with a double ZZ that accentuates the exotic, creating appeal to those with traditional pallets as well as for the curious that seek adventure in their shopping. We also like the phonetic sound of ITZZA (It's a .......). 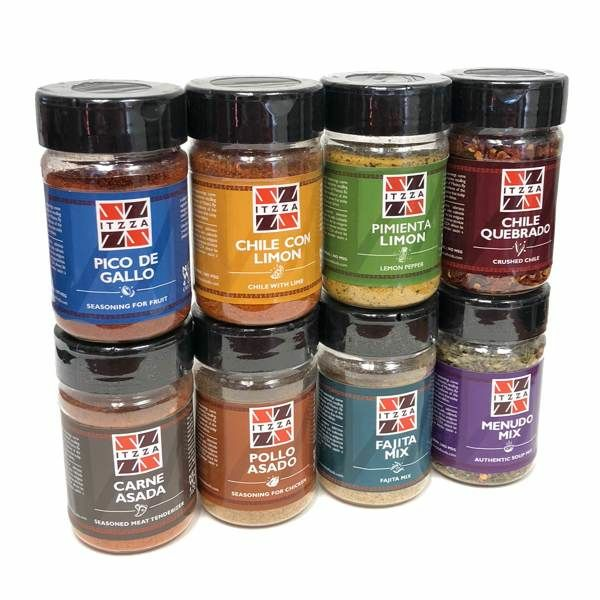 ITZZA Authentic Mexican Seasonings for grilling beef, chicken, pork, cabrito and spice to every dish from seafood, salads, soups, casseroles and salsas. ITZZA Sazonadores incluye los siguientes tipos: Carne Asada Mix, Pollo Asado Mix, Fajita Mix, Menudo y Pozole Mix, Chile Quebrado, Chile con Lim�n, Sal Lim�n, y Pico de Gallo. Las especias que componen nuestros sabrosos condimentos y sazonadores ITZZA, provienen de la tierra que ha sido cultivada desde hace siglos recortando los tiempos de los antiguos Mayas y Aztecas de M�xico. Adoptando las mismas t�cnicas y tradiciones de nuestros antepasados. ITZZA ofrece las sabrosas mezclas de especias que hoy brindan saz�n a nuestros platillos favoritos Mexicanos. All the seasonings are great and add so much more flavor to ordinary meals. Recipients of these spices, as gifts, have just raved about them. Highly recommended for anyone that likes to cook! These flavorings bring a delightful flavor to eggs, all meats, salads,many vegetables, and sauces. Be creative and taste how each impacts your recipe. Exploring is worth doing Not all pairings are perfect, but take a chance and build your own set of "Hidden Flavors." ProsFresh! Flavorful. Heat impact was less than the flavor of the ingredients. "Ahhh" is so much better than "Aieeee!" ConsA beginners menu would have been nice. Somehow, the meals I made were worth eating.